Robert Moloney and Kayla Deorksen in C'mon, Angie! Photo by Tim Matheson. Last year, a Vancouver born comedy tour took the country by storm, featuring women who turned their sexual assaults into comedy gold. C’mon, Angie!, currently on stage at the Firehall Arts Centre, follows those footsteps and pushes them to new heights. Darkly funny while sprinting the fine line between show and tell, C’mon, Angie! is a tragicomic lesson in reflection that is heartfelt, hurtful, and filled with familiarity. Angie, played by a stunningly vulnerable Kayla Deorksen and Reed, a perfectly pitiable Robert Moloney, are acquaintances, turned lovers, turned accusers. Neither can really trace their drink-smeared thought process to find what brought them to bed, but one thing is clear: Angie has slept with her boss’ husband after a chance meeting at a bar, and then he sexually assaulted her. Using every angle of every argument, the play follows the moment of post-coital confusion through to the staggered exit of a broken pair of humans as they try to navigate a conversation where no one wins. The performances are disarmingly nuanced allowing both characters a range of emotion and motivation. 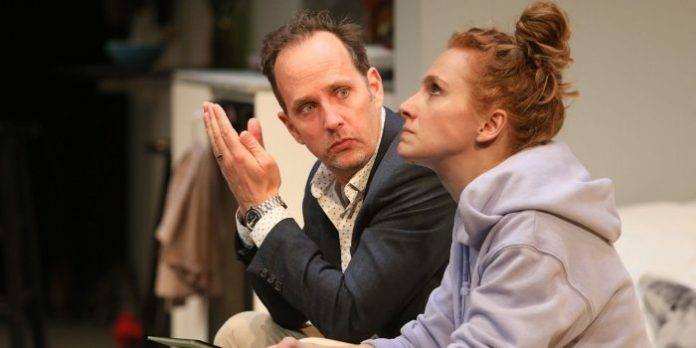 While Kayla Deorksen shines with the exhausted courage of Angie, Robert Moloney plays into Reed’s untrained sexism with an almost child-like innocence. The play is built on the assumption that the audience knows and will agree that sexual assault is bad, and that the events of the play are about sexual assault. But the beauty involved in the dramatic tension comes from the actors’ commitment to seeing out an impossible conversation. Sarah Mabberley’s set design is a L-shaped Tetris apartment that allows the actors to slide around one another to reveal and conceal before locking them into position. Sammie Hatch’s sound design is a jarring reminder of the outside world that effectively underscores the casual reality of the drama. Alaia Hamer’s costumes underscores the unspoken hierarchy between the characters, while still providing ample opportunity for sight-gags. C’mon, Angie! is the kind of theatre that is often attempted but rarely succeeds. It strives to make a point yet does so without hate, without malice, and without preaching. It is raw, true, and desperately common. It is a slice of life we refuse to admit we’ve tasted. Go see it. C’mon, Angie! by Amy Lee Lavoie. Produced by Flying Start Touchstone Theatre in association with the Firehall Arts Centre. Directed by Lauren Taylor. On stage at the Firehall Arts Centre (280 E Cordova St, Vancouver) until June 9. Visit firehallartscentre.ca for tickets and information. Editor’s Note (5 June 2018): the review updated with correct attribution for sound designer.